Let’s get your vocals under control with the best vocal compressor plugin software. All of which were researched and recommended by the best. Quick answer: Softube Tube-Tech CL 1B is the favorite, but if you’re looking for something less costly, take a look at the FabFilter Pro-C2 as perhaps the most popular option out there. However, picking off a couple isn’t good enough, compressors differ based on character and style. Compressors are a bit of a controversial plugin in some ways, as to many it is mystery how it works… and even more of a mystery as to what it can do for them. This is especially true when it comes to vocal compression. But as simply put as possible, a compressor compresses dynamic range. So that means that above a set volume (threshold), the compressor will limit the amount of volume increase going out the back end (output) compared to what is coming in the front end (Input). Given that basic function (compressing and audio signal’s dynamic range), you can imagine the vistas of creative potential open to producers. Imaginative engineers realized you could use them creatively to re-shape the transient shape of sounds. Presto! Compression algorithms became secret sauce. Hence many fancy named compression techniques, such as of side-chaining, parallel compression, etc., are now used. But not just in a technical way, but as if the compressor was itself a musical instrument. However, we are on the topic of vocal compressor plugins. So, keeping that in mind, there are a few features that every good compressor should have. Let’s find out. If you follow forum discussions, you will find a lot of opinions about the various types of processors out there. Each producer has their favorite because, given time and experience, one compressor can be somewhat like another. Threshold – which determines the level your audio signal must be before the compressor can reduce its volume. Ratio – determines the level of compression that will be applied to the audio signal once the loudness threshold is reached. Attack – how fast or slow the compressor will be activated to reduce loudness. Release – how fast or slow the compressor will be deactivated to return the audio signal to is original level. Knee – smooths out the ratio so that there isn’t a sudden change in dynamics. Make-Up Gain – used to “make-up” the amount of gain that has been lost from all that amplitude attenuation. Output – allows you to increase or decrease the sound coming out of the compressor to a desired level. For a more detailed explanation of each, read this real funny exposition of audio compression in music production. Beside these featured listed, a compressor may function slightly differently, or offer some additional features that make them useful for whatever purpose you want to use it for… in this case, mixing and recording vocals. There are “Character” units, and “Vanilla” units. Like the name suggests, a good character compressor will add some depth and personality to your vocals. A vanilla compressor will get the job done without you know it was even in the room, like a good butler. Other than that, another thing to look for in a compressor is versatility. That and the ability to get the results you want reasonably quickly. Sometimes those things will conflict a bit. That is why we choose a plugin which fits our needs the best. 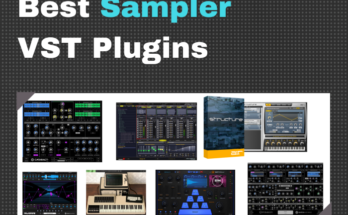 Make sure to check out “Final Thoughts” for further notes and comparison on each VST compressor plugin. Softube is a great name in overdrive DSP and this FET emulation has many, many fans. This one is of an optical unit. A high-ticket opto unit that many love for its “musicality,” but may be out of some user’s budget. Feature wise it’s a lot like the popular CLA-76 from Waves that we mention below, but the source unit has a unique behavior that made them a top choice. The optical method is prone to being softer and gentler to vocals, while still being able to lay down the law when necessary. You tend to start out wiggling the vaguely labelled knobs and suddenly something great appears in the murk. This is character processing at its best, and if the unit sounds good then you can’t beat it. The only downside to nitpick at is that if you’re a control freak you can also find it frustrating, since you can’t so much “control” this unit but rather “guide” it like an air traffic controller guiding a Boeing 747 onto land. That said, it’s good to give up some control, especially if you know there were some experts at the wheel behind this thing, and the results are often solid. Waves have been around for a very long time and for much of it as the top name in the game. Their plugins used to be really expensive. Nowadays if you catch them on sale they are cheap as chips. And general pretty good value for that. The CLA-76 comes in two guises (blue & black) and both are emulations of versions of a classic 60’s Compressor/Limiter. People still pay big coin for hardware versions of these things for “modern” recordings. Feature wise, these units don’t have a lot on offer. Input, Output, speed the Ratio Curve operates, and then a section of Ratio pre-sets. Sounds dull, I know, but in-practice they can be great. CLA-76 has a pretty fast Attack, meaning there isn’t too much time between a loud transient arriving and the compression goblins leaping into action. Great for drums as you can really flatten them to add thickness, edge and size. Another thing to watch out for is that these units add saturation which changes the “weight” of the sound with wee bits of distortion overtones (and some undertones too). This means the units respond very nicely to being hit hard. More Softube, more emulation. Everyone loves a bit of bounty hunter scum. Or so it would seem with another 1176 emulation. This one looks more like a 70’s Hi Fi than the original though. Price-wise, when it’s not on sale, it costs more than the Waves unit mentioned. So it’s a good idea to take a look to see if you’re lucky. However, FET has more features. Softube added some more modern features (along with improving the flow of the knobs) so you can parallel process and alter what parts of the signal trigger the processing goblins. This is doable with some effort in your DAW with the CLA-76, but far easier in the FET. Again, some people love it on vocals, as it can really rough them up add some punch where needed. Many think the parameter additions make this a better bet there. Just keep in mind that some have noticed that the FET can slide into distortion if you aren’t paying attention. This is a character effect (processor to be accurate). So be aware that, while you can use it on everything, including vocals, you may find that you’d want to slap this bad boy onto different things in different places. Another minimalistic blast from the past. The Summit Audio units got popular in the 80’s, particularly for vocals. The reason this style of unit works so well for vocals is that it tends to be kind. Besides the Tube-Tech, the other compressors so far have tended to be rough and rowdy (which has its charm) but the TLA-100 is smoother and less noticeable as it goes about its work. “Smooth”, “controlled”, and “softening” are common adjectives applied to the TLA-100. Softube added a few extra features including a separate saturation section so you can control how tubular it all gets. The Parallel options seems slightly unusual as that effect is normally used with more brutal compressors but we won’t complain that it is there. This compressor isn’t a jack of all trades. But if you want a character unit to supplement your core compression, or you want to choose one unit to live with then this could be it. I may just suggest that it could see you struggle with less controlled singers like Rappers. If you ever feel the need to lay down the law in your vocal mix, refer to the other units mentioned. But for singer-songwriter tracks, this is great. This fellow is the real odd one out here. Not because it’s the best or the worst, but because it’s not a character unit. Pro-C2 is all about modern, practical, versatility, and clean. This is the modern jack of all trades, cover every piece of ground, device that many of us bedroom boys love. Why buy and learn 78 devices when you can get one? It is also simply the go-to plugin for all your compressing duties on every track, not just vocals. So it is well worth it. You get a lot of modes targeted at most of the common things you will want to do with a compressor. For instance, its vocal mode helps you to bring vocals to the front of the mix. A nice little addition to a plugin. Analog, Classic & Optical style modes are also on the list. But honestly, it is doubted that they can really compete with the dedicated units mentioned above. Think of it as leaning a bit that way. Upside? This is the only unit here to offer control over the Knee of the compression critters. Boggling if you don’t get it but super useful if you do. Especially when it comes to vocal mixing. Also, if you ever needed to learn how to use a compressor for mixing vocals, you’ll probably find about as many engineers on Youtube showing you how to mix vocals via the FabFilter Pro-C2 than any other one mentioned. You probably think of it as the ‘Fruity Loops’ of compressors. Also, rather than being stuck in an old-hardware frame of mind the interface is visually informative and very adjustable to suit your task or preferences. You can even pop it full screen on an unreasonable large Retina display! The Tube-Tech CL 1B unit is the favorite by far. But being a high-ticket item, you may want to consider the other four units mentioned if you’re on a tighter budget. Then, you can decide if you want to commit to a path, like owning one unit that you use for everything, or having a couple that fits diverging tastes. In the latter case you won’t have one unit that you have to “fight with” to submit to every path that comes across your DAW. Waves CLA-76, Softube FET and Summit Audio TLA-100. Waves CLA-76 and Softube FET may suit people who mix harder and louder (as most of us have to these days), and whose vocalists need more discipline. Submitting to the Summit Audio TLA-100 could be perfect for the folksier amongst us. But if dollars are the deciding factor, then check if Waves is having one of their many sales right now go grab it! But for the vanilla producer/engineer, the FabFilter Pro-C2 has so many possibilities. Not only in the “I can’t believe it’s not butter” processing, but in dramatic or effect processing that makes it hard to pass by. 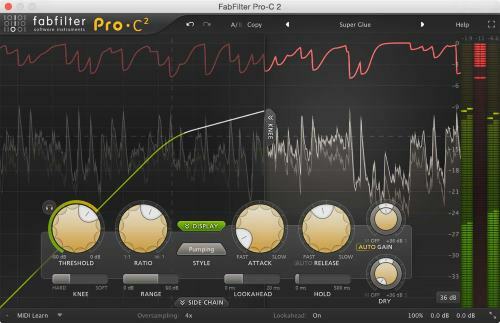 If you want just one compressor and don’t mind the vanilla, FabFilter Pro-C2 is the one ring to rule them all.